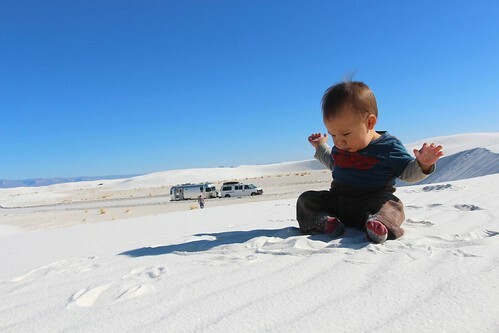 Mali Mish - Day 195: White Sands National Monument. We didn’t stay long during our last visit and this time we won’t either. 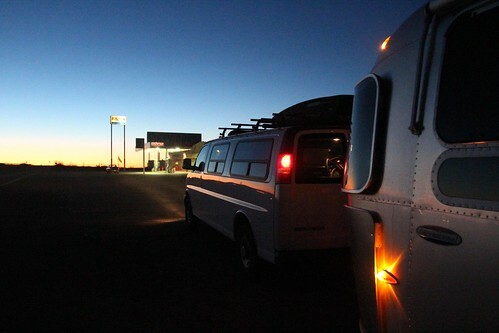 We are hoping to make our way closer to California before we start to slow down. I have been noticing some excessive shoulder wear on the trailer tires on one side. 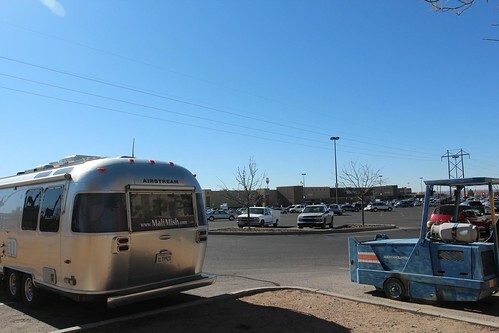 Even though it is unlikely to be a wheel balancing issue since it is a towable vehicle, I decided to take it into the local Big-O Tires in Las Cruces to have them do a free tire rotation anyways. 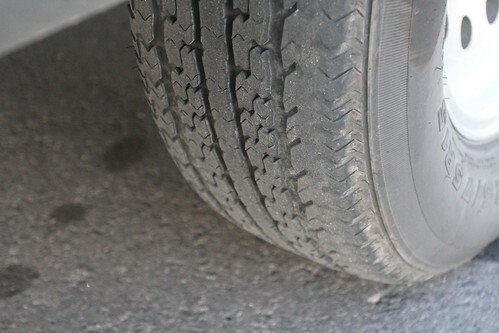 We bought these tires at the beginning of our trip back in July of 2012 and they have held up really well after nearly 15,000 miles. The shoulder wear is most likely due to an issue with our axle. That is something I don’t really want to think about right now. 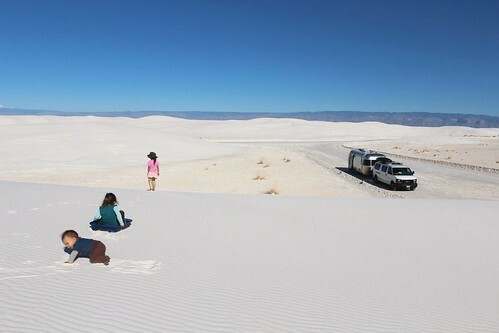 The only places we had on our must-visit list near Las Cruces is White Sands National Monument. We had an amazing afternoon here 3 years ago and we could not pass up the chance to come back again. If you want to learn all about how this place came to be, I did a pretty lengthy write up of it when I posted about our last visit. 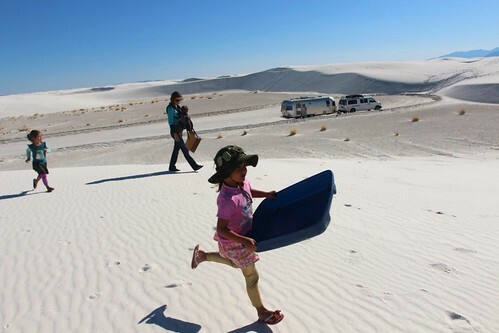 Today, I will just show you some amazing photographs of yet another beautiful afternoon here with clear skies, white sands and a warm sun. The road that leads you into the monument starts out as an asphalt covered road. 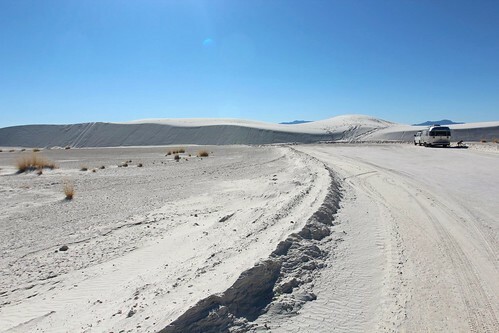 After a couple of miles, it all turns white as the winds blow the fine gypsum sand all over the landscape. 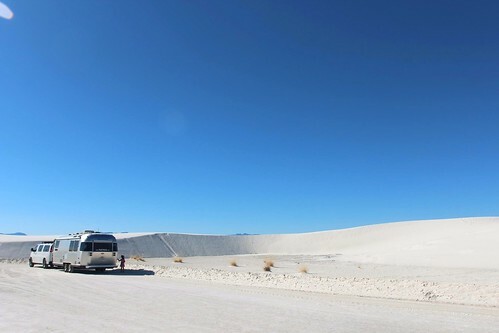 We found a little area all to ourselves and parked the Mish along the side of some dunes. 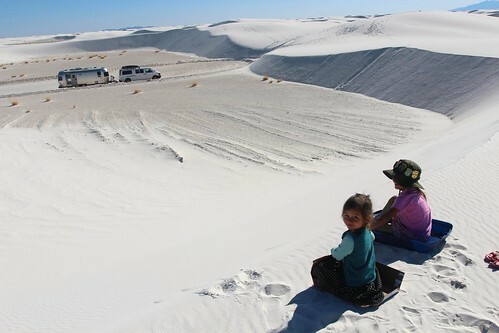 You can either buy or rent a sled to ride down the dunes here at the visitors center. Instead, we thought that we would be clever and use the lids of one of our many plastic bins in the back of the van. They didn’t work as well as the girls would have hoped but it is pretty tough to not have a good time here. 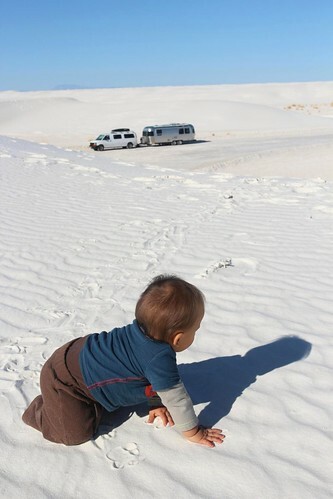 Gypsum sand is so fine that it will get into every little crevice. 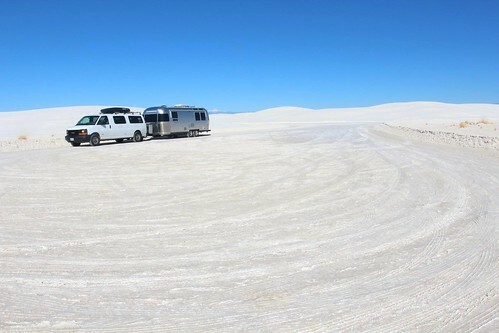 When we left here last time, we found gypsum sand in the van all the way across the country. It can get really windy here since after all, it is the wind that brought all of this sand here from the lake beds out in the distance. We were lucky during both of our visits that it was sunny and beautiful with just a light breeze. 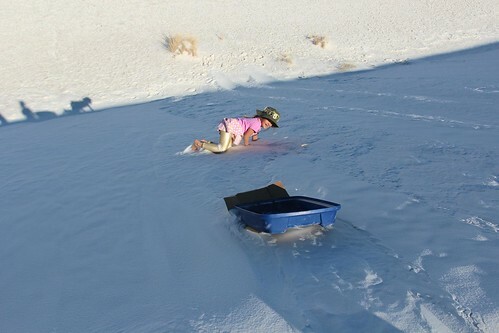 Maybe next time we will splurge and buy some of those sleds in the visitors center. 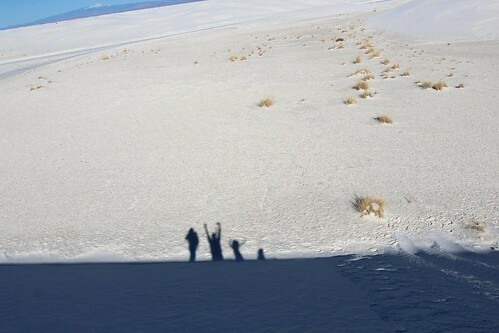 As the sun was setting, it cast perfect shadows of us at the bottom of the dunes. I wish they allowed overnight parking here. It would be amazing to spend the night right where we are parked. 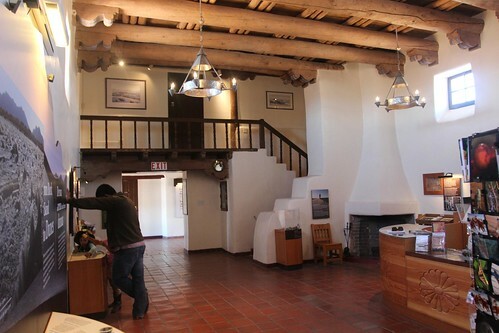 There are footprints left here every day by visitors from all around the world. By morning, they will all be covered up with gypsum sand one grain at a time. 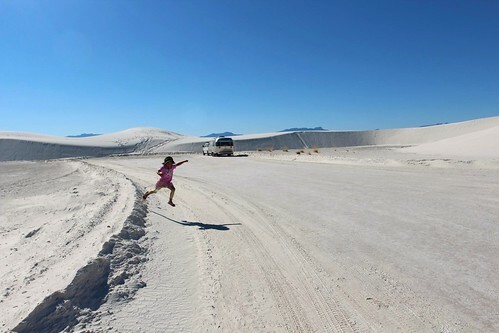 It’s not all fun and games during our visit to White Sands. 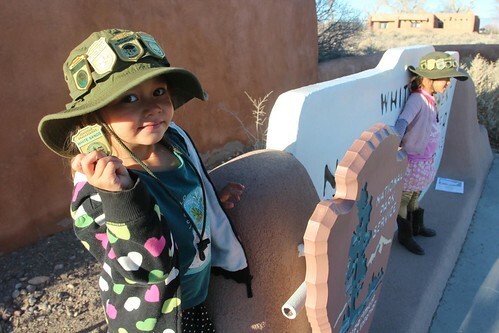 The girls have to work to earn their Junior Ranger badges. That makes 8 for Mila and 9 for Ava. Luka is also getting a small collection going with a couple of honorary badges given to him by a couple of parks for providing his sisters moral support. 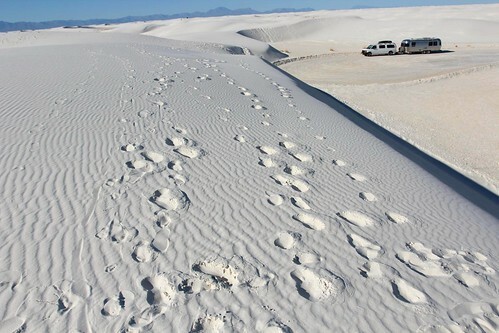 We left White Sands National Monument and started heading back towards I-10. It is about a 1-hour detour from the interstate. About 2 hours away from the park, we noticed that none of us have any idea where our camera was. 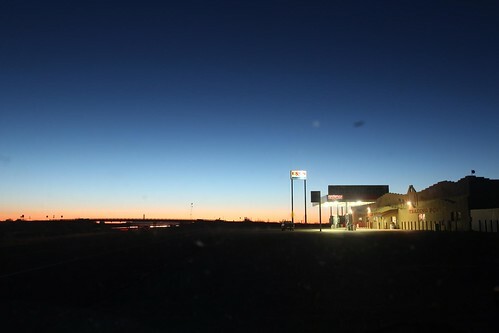 We stopped at this gas station in the dark to search high and low for the camera praying that we didn’t forget it. If we could not find it, we would have to spend the night here and drive all the way back tomorrow to continue our search. Well, since you have been seeing these pictures, it means that we indeed found the camera. 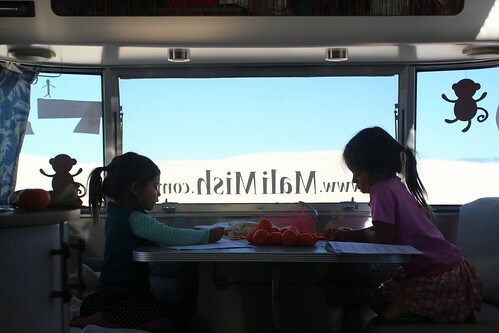 We had left it in the Airstream and even though it had fallen on to the floor during the drive, it was not harmed. We are not quite done with New Mexico yet on this trip. 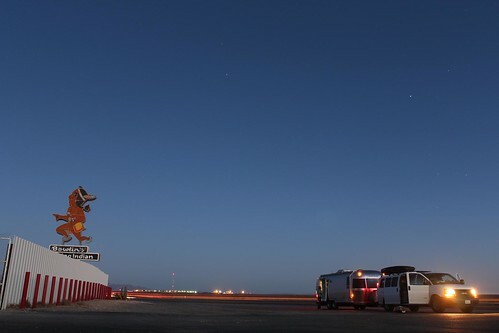 We will be spending the night in Deming for another outing tomorrow before heading into Arizona. 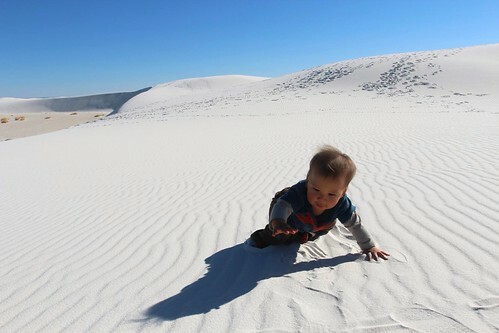 One Response to Day 195: White Sands National Monument. Beautiful pics! So glad you did not have to double to find your camera! I love New Mexico.